Cecile-Louise-Stephanie Chaminade was born in Paris in 1857. From her mother, a pianist and singer, she received her introduction to the piano and continued to study with members of the Conservatoire de Paris, emerging as an outstanding performer in France, Europe and the United States. From the 1880's Mme. Chaminade's compositions for voice, piano and other instruments began to appear. They include the Ballet Symphonique (with its now famous "Scarf Dance"), the Concertstuck: sonatas and trios for piano and strings, the Concertino for flute and orchestra, and many etudes de concert, mazurkas and serenades. After several performance tours in the United States in the early years of the 20th century, Mme. Chaminade became a celebrity, a trailblazing female composer, endearing herself to audiences everywhere. Many musical performance clubs named for her sprouted up, including our own. The Chaminade Club of Providence was organized in 1905 by Mary Kimball Hail. Performance/Musicales were offerred monthly in various locations around Providence before becoming a regular event at Mrs. Hail's home. Mrs. Hail served as president of the Club from 1905-10, 1912-1914, 1921-23 and 1930-33. 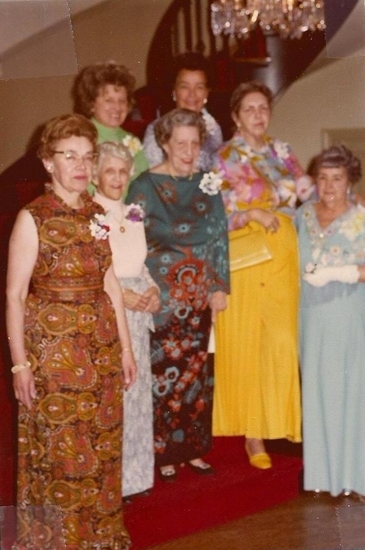 Past Presidents: Annie Rienstra, Gladys Burdick, Dorothy Pierce, Emma Smith, and Helene Meenan. In the rear, Jane Cranston and Elsa Anderson at President's Day Musicale 1975.